• Brockett and Hiemstra (1991) claim that, "self-direction in learning refers to both the external characteristics of an instructional process and the internal characteristics of the learner, where the individual assumes primary responsibility for a learning experience" (p. 24). • Gibbons (2002) stated that “SDL is any increase in knowledge, skill, accomplishment, or personal development that an individual selects and brings about by his or her own efforts using any method in any circumstances at any time” (p. 2). • Kasworm (1983) stated that self-directed learning can be viewed as a "set of generic, finite behaviors; as a belief system reflecting and evolving from a process of self-initiated learning activity; or as an ideal state of the mature self-actualized learner" (p. 1). • Knowles (1975) described Self-Directed Learning (SDL) broadly as “a process in which individuals take the initiative, with or with out the help of other, to diagnose their learning needs, formulate learning goals, identify resources for learning, select and implement learning strategies, and evaluate learning outcomes” (p. 18). meliputi identifikasi dan pencarian informasi. belajar dengan mempergunakan berbagai alternatif atau strategi belajar. So according to our opinion, self directed learning is a process planning study that independently starting from the preparation of the study, looking for learning strategies, achieving the goals of the study even manage the learning system is independently conducted with the aim to develop initiative, kreaktivitas, mindset and knowledge as well as information obtained from learning that is conducted independently. Self-directed learning can be challenging, even for the brightest and most motivated students. As a means of better understanding the processes involved in this mode of study, this tip sheet outlines key components of four key stages to independent learning – being ready to learn, setting learning goals, engaging in the learning process, and evaluating learning – and offers some tips for both faculty members and students. Various skills and attitudes towards learning are required for successful independent study (See the Centre for Teaching Excellence (CTE) teaching tip on "Readiness to Learn" for more details). This step requires time for analysing a student’s current situation, study habits, family situation, and support network both at school and at home – and as they continue in the program, progress in degree program and past units taken that will prove useful. Signs of readiness for self-directed learning include being: autonomous, organised, self-disciplined, able to communicate effectively, and able to accept constructive feedback and engage in self-evaluation and self¬-reflection. • What are my needs re: instructional methods? • Who was my favourite teacher? Why? • Deep approach involves transforming – to understand ideas for yourself; be able to apply knowledge to new situations and use novel examples to explain a concept; learn more than is required for unit completion – most ideal for self-directed learning. • Surface approach involves reproducing – to cope with unit requirements; learn only what is required to complete unit in good standing; tend to regurgitate examples and explanations used in readings. • Strategic approach involves organizing – to achieve the highest possible grades; learn what is required to pass exams; memorize facts as given in lecture; spend much time practicing from past exams; most concerned with whether material will appear on exam. • Students must be able to engage in self-reflection and self-evaluation of learning goals and progress in a unit of study. • Students should regularly consult with the advising faculty member. • Students should be able to engage in self-validation of achievements, but should have the motivation to seek feedback on progress and ideas from the advising faculty member or other available resources. o How do I know I’ve learned? o Am I flexible in adapting and applying knowledge? o Do I have confidence in explaining material? o When do I know I’ve learned enough? o When is it time for self-reflection and when is it time for consultation with the advising faculty member? 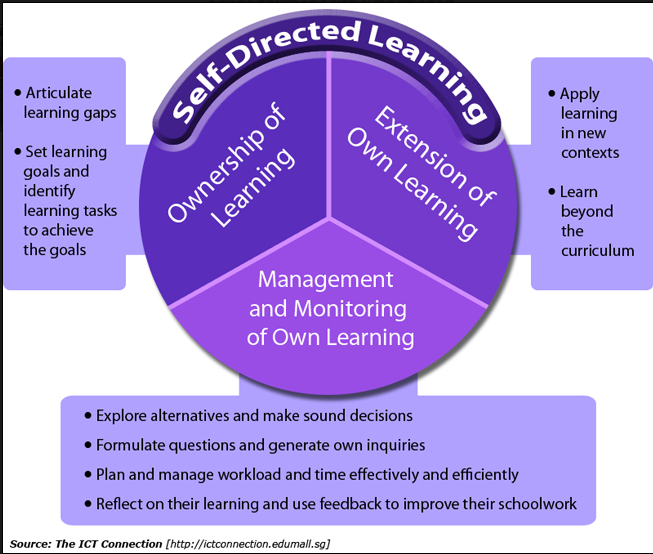 C. What Can Teachers do to Support Self-Directed Learning? One of the most important tasks of the teacher is to raise student awareness of their roles in learning. Taylor (1995) suggests engaging students in discussion on topics from the Self-Directed Learning Readiness Scale. Examples of topics are: I know that I want to learn and that I am a learner, so if I want to learn something, I can, and I like to learn and to solve problems because I know that thinking 'hard' can be fun. The exercise of evaluating oneself on such topics was found to have positively influenced learner awareness. Lyman (1997), who works with readers, suggests generating similar discussion through the use of questions designed to help learners become aware of what good readers do and how to become one. Among the examples he provides are: Did you read better today than yesterday? Could you keep the ideas in your book straight in your mind? Were there words you did not know? How did you figure them out? Teachers need to model learning strategies such as predicting, questioning, clarifying, and summarizing, so that students will develop the ability to use these strategies on their own. Teachers also need to allow individual learners to approach a task in different ways using different strategies. Students set learning targets for himself/herself.  Students know which parts of the lessons that do not understand.  Students ask questions when student is not sure about the lessons.  Students look for more information to help student understand the lessons better.  Students make a list of what they needs to do for his/her learning.  Students complete their schoolwork on time.  Students try to understand where they went wrong in their schoolwork.  Students try different ways to solve problems on their own.  Students use what they learn in class after the lessons.  Students find out more than what their teachers teach them in school.  Students use the computer to go online to ask people outside their school for ideas on the lessons; become better at a skill that they is interested in e.g. learn a language; and/or get ideas from different websites and people to learn more about a topic.  Self-directed learners are motivated and persistent, independent, self-disciplined, self confident and goal-oriented.  Self-directed learning is quite time consuming.